Ski touring has become extremely popular in recent years. Check out our guide to ski touring! Many of Morzine’s locals will probably agree that there are two or three types of ski tourers. The first are the die hard alpinists who get up early wearing skin-tight lycra with water bottles strapped to them to keep them hydrated. Often reaching the top of mountain peaks from the valley floor before most have put the kettle on in the morning, these athletes seemingly have lungs similar to Michael Phelps with the speed they climb. These guys & girls will climb as soon as the snow falls and won’t stop until May. Fitness and reaching mountain peaks as quick as possible is the goal. Many say this type of ski touring is great for road cyclists as it builds up similar muscles, and works well for pre-summer training. Using thin skis which weigh the same as a bag of sugar, this equipment isn’t made for deep backcountry expeditions. Think about this as the road cycling type of bicycling, using super light carbon fibre bikes to trim as much weight as possible to save energy whilst climbing. This isn’t the most popular form of ski touring for holiday enthusiasts with only a week to make the most of the mountains. However, it is a good way to see the mountains whilst not paying for a lift pass. The second is the type of ski tourer that has a hybrid ski touring set up. With the rise in technology making alpine ski bindings & hybrid alpine touring boots that also unclip into ‘tour’ mode stable to walk up hill and charge downhill – this type of ‘ski tour when you like’ ski tourer has boomed in the past few years. Whether you just spend one morning a week hiking, or you just ski tour to get to the untouched powder a few days after snowfall – finding a touring set up that is right for you is much easier than 5 years ago. 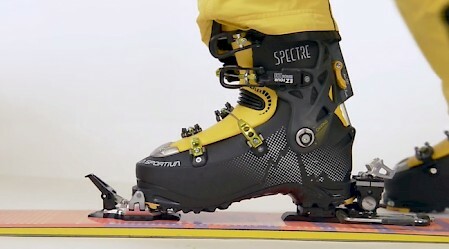 You can often mount up all mountain skis with a touring binding to enjoy the whole mountain and brands have perfected this type of touring ski, binding & boot in recent years. Many ski shops in Morzine and across the UK have a good range of touring skis which have been designed to ski the mountain with a fair amount of ease. We’re not saying that edge turning will be like a perfected all mountain ski, but it’s now much easier to have a couple of pairs of skis for a range of conditions rather than separate skis for piste, powder, park and touring. Traditionally, if you stripped a ski back to it’s lowest weight for touring up-hill, you’d loose a lot of the skis performance skiing downhill. Fortunately, manufacturers have made bindings and skis light enough to save energy on the climb whilst not compromising the ability to charge downhill. Things change very quickly within the industry – but have a look at these products for and make the most of the remaining August deals online and in shops. *Skins can be cut to the skis shape and length or you can get pre-cut skins. Here is a list of the various skins for the akis listed above. Boots are completely dependant on your foot shape, movement, height, weight, and ability. We recommend getting fitted in resort by a specialist so that you can get boots tweaked whilst you are out on holiday. All boots should have a footbed designed for your movement and foot type. Scarpa, Salomon, K2 & Full Tilt all do a range of downhill touring boots. Get them fitted for your foot and don’t pick the boot due to its colour! We’d be more than happy to recommend and book you in for a ski boot fit in Morzine, with Beanies offering a great boot fitting experience. Ski companies have focused on ski touring and the ‘Earn You Turns’ mentality very heavily over the past 3 years. Perhaps it’s Jeremy Jones incredible Snowboard Expeditions rubbing off on the ski industry, showing that you don’t have to take a helicopter to film segments, or perhaps people are seeing the benefit of walking off that Tartiflette they had at lunch! Either way – we like the shift at Mountain Mavericks. Pushing the boundaries of a ski resort to find new and hidden areas on the mountain created for the most memorable days of our season last year. However – you must be warned. You can’t just buy a touring setup and go. You need some expertise about the conditions, the surrounding mountains and own (and know how to use) appropriate search & rescue equipment. Here is a video of skiers caught in an avalanche in Chatel. An area we have skied before, and very easy to get to from Morzine. This shows how things can go wrong when going off piste. There are a number of instructors and courses that can be done in Morzine to teach you about Avalanche rescue and ski touring. If you’re interested in taking up ski touring or split boarding then get in touch and we’d be more than happy to give you some advice on equipment whilst organizing you an avalanche course and session with a ski touring guide. Simply get in touch with us on thechalet@mountainmavericks.com quoting ski touring in Morzine and we’d love to chat about some options with you. Until then – here is a video by Glenmore Lodge giving you an introduction to Ski Touring! Next: Remember The Art of Flight? Well Red Bull Just Released The Fourth Phase!